The Winter of Robots by Kurtis Scaletta. Review: What was that, asks Jim. "What are you talking about?" asks Oliver. I bet you've had a time when you felt that you absolutely needed to know something. The Winter of the Robots is an adventure, with a lot of questioning and teamwork. Written by The Minnesota Reader's Choice Award winner, Kurtis Scaletta, this book is sure to pique your curiosity. The Winter of the Robots is about a middle school kid named Jim. He has always done the science fair with is friend, Oliver and they have always built a robot. But after Jim is tired of being the little helper, he dumps his best friend and chooses a girl named Rocky instead. Jim and Rocky decide to do their project on otters, and they spot some by the river that is by the old abandoned Nomicon site. When they go set up cameras in the abandoned site, they find out it is not really abandoned. Something is living in this junkyard-something big, heavy and who totally does not want them visiting its junkyard. They find out they are fighting robots, and they know that the only thing strong to beat a robot is another robot. Can Jim, Rocky and Oliver put their feelings aside and defeat these massive robots, with Oliver's smarts, Rocky's Skills and Jim's Programming? Winter Of The Robots is a very well written book. Scaletta has packed this book filled with so much action at every corner that you are just dying to see what is next. I never could put this down; it was so fascinating and so entertaining to see what would happen next. I also like how Scaletta got into the whole robot thing and made the characters knowledgeable using robot vocabulary like ultra sonic sensors, connector cables and so much more. He also did a good job with description, for example when he described the robot in Jim's perspective, he used really descriptive words like "intense" that made me actually get a clear picture of what they are going up against. 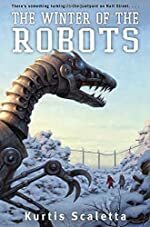 The Winter of the Robots has a little bit for everyone, it has adventure, fantasy, robots, and middle school students are especially able to relate to concepts in the book. Review written by Ian (6th grade student). We would like to thank Random House for providing a copy of The Winter of Robots for this review. Have you read The Winter of Robots? How would you rate it?